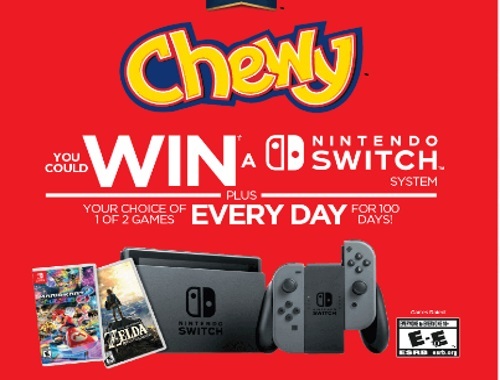 Enter to win a Nintendo Switch System plus your choice of 2 games everyday for 100 days! Total of 100 Nintendo Switch systems with your choice of either The Legend of Zelda: Breath of the Wild game OR Mario Kart 8 Deluxe game available. One (1) system and game to be awarded each day during the Contest Period (ARV $480 ea). Look for your unique PIN printed inside specially marked boxes of Quaker Chewy, Quaker Chewy Super Grains and Quaker Dipps granola bars (130 g – 156 g).